What’s the point of a blessing before eating? Would you or Susan write about the appropriate way to pray before meals? I’ve heard two different views. One view indicates that we shouldn’t “ask” for our food to be blessed, as God already said, as His people, He will bless our bread and water. Instead, we should simply bless & thank Him, as our provider, etc. The other view indicates we should, indeed, ask His blessing on the food, prior to partaking of same. Although this isn’t your question, we (at Ask the Rabbi you get both of us!) would like to explain one of the major misconceptions about kosher food. Many people think that kosher food is food that is blessed. When a company has kosher certification, as thousands of large and small brands do, rabbis visit the company’s manufacturing facilities. However, they are not coming to bless the food but to supervise the production. Depending on the food, a rabbi might stay on the premises full time or alternatively drop in for sporadic visits. Every ingredient and its source, the methods of cooking and even the delivery containers are scrutinized. The blessing we say after eating is longer because it requires more effort to induce spiritual humility in ourselves when our stomaches are full than when we are feeling hungry. What exactly blessing God means is complicated. The Hebrew word blessing, bracha, has many dimensions. For instance, the word also means knee from which we derive the concept of going down onto our knees and kneeling before God. We have an entire chapter on that one word in our book, Buried Treasure! So, in fact, the blessings surrounding eating incorporate both an appreciation of God as our provider and also recognition that eating is a spiritual as well as physical blessing. We hope this helps. I just wanted to say that I absolutely love this! Thank you! Thank you for taking the time to tell us, Cynthia. But this we know for sure. It wasn’t particularly challenging since Pharaoh’s own in-house magicians were also able to do the old rod/snake trick. in the final analysis, it is impossible to find faith in God along the road of magic tricks, illusions, or factual prestidigitation. 2. Wanting to learn how to transform them from Living to palitve (slaughter) them. Sorry, Carl, but rabbits are specifically mentioned as not kosher in the Bible. We do have quite a few rabbit mugs/placemats etc. in our home since our last name is French for rabbit, but we don’t eat them. I regularly fantasize about a mythical great grandfather who raised rabbits in Provence. He lived in a small village, La Garde-Freinet about 12 miles NW of St Tropez. His business model was to dye cute young baby bunnies into pretty pastel colors and he sold them very inexpensively to passers by to give to their children as pets. His particular selling point was that he promised that as soon as the pretty baby bunnies turned into less pretty big grey rabbits, he’d happily exchange them for another pretty colored bunny. Thus his customers were assured of a lifetime supply. For as long as they wished they could enjoy the company of a pretty pink, green, blue, or yellow bunny. When the color wore off they’d bring the big rabbit back to great grandpa and take back home a new baby bunny he’d happily provide. For his part, great grandpa never had to bear the costs of feeding and raising his rabbits. That burden was happily sustained by the youngsters and their parents–his satisfied customers. Little did they know that the rabbit meat they subsequently purchased at great grandpa’s butcher shop started off as pretty baby bunnies that their children fed. Hope you prosper as did great g’pa. If rabbits are not Kosher, did Grandfather break any biblical prohibitions by butchering them? But you ask a good question and the answer is no, the Bible prohibits Jews from eating rabbit but not from slaughtering or selling them to others. The Bible tells us many things, some that come to my mind as I read this question and answer are these: Pray as the Spirit leads, it may be one thing one day and another thing another day. I don’t believe there are right and wrong ways to pray if we always do everything to the glory of God. If He is the center of our life, we are in the safest place we can ever be. Linda, this is one of the areas where Protestantism and Judaism differ. There are many opportunities in Judaism to pray ‘as the spirit leads.’ There are also words that are proscribed and said on a daily basis at mandated times as well as special prayers for Shabbat and holy days. We understood this week’s question to be asking about how we pray before meals and we have specific prayers for before and after eating specific foods. We certainly agree with your closing sentence. To dearest Rabbi and so-introspective-and-supportive Susan, oh thank you SO MUCH for addressing this question. Every cell of my being CRINGES (to put it mildly and politely here) at what I consider a hideous and shameful trend, of people actually justifying not formally acknowledging & thanking God for their food/their blessings/etc. One of the most heinous things to produce is a thankless generation – think about an ungrateful, unexpressive child who never verbalizes his thanks for what is done for him. Not meaning to be offensive to the questioner, but recall the sons of the prophets who came to Prophet Elisha and discovered there was “death in the pot” – needing the miraculous intervention of the anointed prophet to remedy the, yes, “already-blessed” food. I think of the complaining Israelites who greedily and ungratefully chowed down on the birds that God blew in to them, only to die with the meat still unchewed in their thankless mouths. I think strongly of the sorrow and devastation that Jesus must have felt, when after healing 10 lepers of their disease, only 1, and a Samaritan no less, came back and fell at His feet to thank Him. You can feel the sadness in Jesus’ voice as He said, “Were there not ten cleansed? but where are the nine? There are not found that returned to give glory to God, save this stranger.” (Luke 17:17,18) NEVER would I want to cause God such sadness and disappointment in my thoughtlessness! I LOVE and wholeheartedly agree with how you thank/bless God before the meal etc., (and loved your point about it being important for our ears to hear our mouths thank Him, not even to mention the testimony that this world desperately needs to see, perhaps it may bring conviction upon someone). And I ADORE your custom of thanking/blessing God AFTER having being sated, and taking a LONGER TIME to do it, in order to cultivate thanksgiving and honor through and through into our very-self-absorbed, very-feeble, and very-forgetful souls. WHAT A TREMENDOUS THING TO DO!!! When I was a little girl, my mother always told me that I had to thank God for any answered prayers at least as many times as I had prayed for the matter. (I had to pray for about 2 years thanking God for causing the hostages in Iran to be released when President Reagan came into office because it had become a regular part of my nightly prayers!) I am also reminded of some extra-Biblical lit I’ve read, particularly how 1st man Adam was always erecting an altar and offering some type of thanksgiving sacrifice/offering (and of course so many of the Patriarchs etc. who followed suit). While of course we don’t pay God for what He does, or think that our offerings force His Hand to move on our behalf, nevertheless we must not forget that SOMETIMES we should express our thanksgiving and gratefulness to Him by giving Him more than just a verbal and heartfelt “thank you”, but also by pouring out our beings financially or otherwise, over and above what our regular custom of giving unto the LORD may be. Ugh. Not thanking God for the food He has allowed you to have before you? What about thanking Him that your mouth works, your miraculous body is functioning and digesting, you can swallow, you aren’t wracked with disease that makes you nauseated so that you vomit everything you try to ingest, what about remembering the life of the animal that died so that you could consume its flesh, what about being grateful for the miracle of crops and plants, what about being thankful that you are not living in the midst of a famine, how about those…just for starters??? Anyway, I am waxing eloquent because it’s 3:52 am, but also because this is an important issue!!! 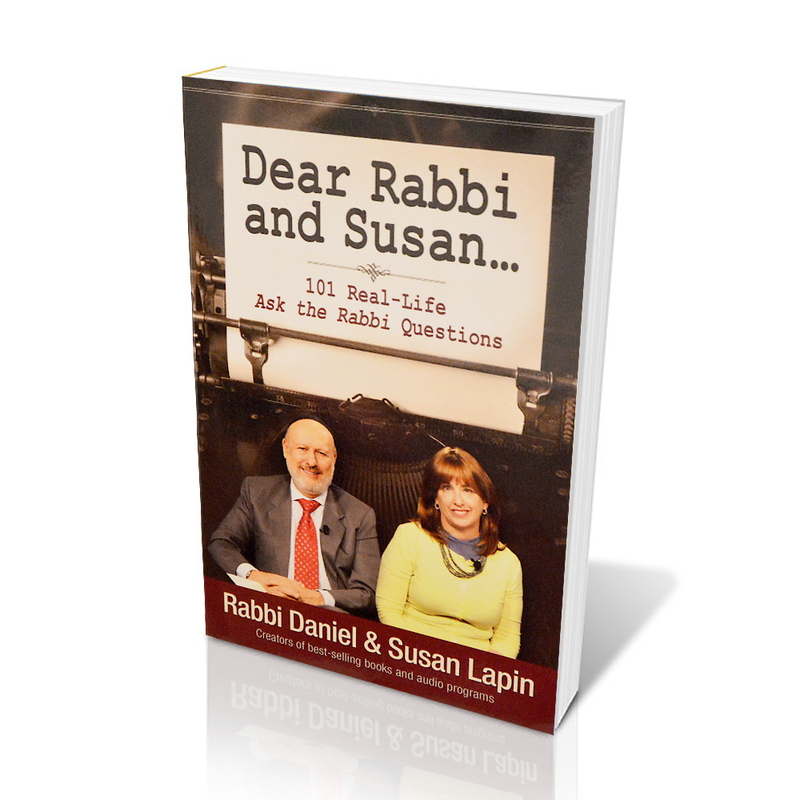 So Rabbi Lapin and Ms. Susan, THANK YOU for your WONDERFUL answer to this dilemma (which shouldn’t be a dilemma at all)! I LOVE what you say, I shared it with EVERYONE at our midweek prayer meeting, and EVERYONE including myself of course adopted your practice of thanking God AFTER His provision for a LONGER TIME than before. JUST GREAT!!! GREAT!!! My preacher preached a message years ago at Thanksgiving entitled, “Those Who Live Thankful Stay Whole”, and it is so true. LOVE IT!! THANK YOU!! THANK YOU!!! THANK YOU!!! And thank GOD in Heaven for ALL His Wonderful Works and ALL His great Mercies to us, Who could ever thank Him enough??? None of us!!! THANK YOU FOR YOUR ANSWER, GREAT ANSWER!!!! Celeste, if you’re that passionate at 3:52 am, you must be a real live-wire in the middle of the day! Jews who try to live by the Torah actually do start our days with a ‘thank you’ for waking up and shortly after that we list items for which we are thankful such as being able to see, get dressed, stand up straight etc. I remember battles of wills with various toddlers until they learned that they wouldn’t receive things if they didn’t say thank you. Much better and easier to learn that as a small child than in later years.